If you are building or renovating a home, you might want to take advantage of the latest smart technology, like the owners of this amazing conversion (on the left). Neutral wires - There are very few automated light switches that don’t need a neutral wire so you should make sure this is included in your specification. In-wall transmitters - In-wall transmitters allow you to control groups of lights and pre-set lighting patterns. With one touch, you can quickly adjust all the lights in a room to match your occasion or mood. 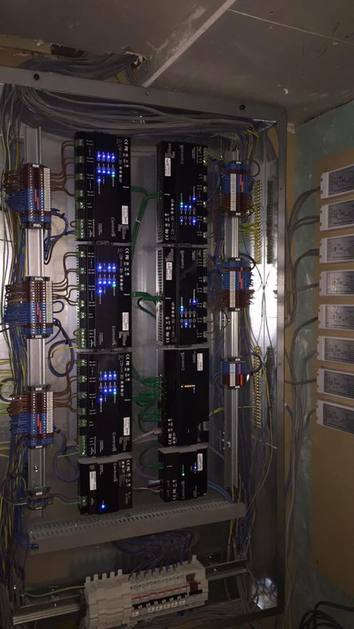 You’ll need to plan the location of the junction boxes and wiring for these control panels. Junction boxes - Some switches and keypads have a slim design, but if you haven’t yet decided which products to use, it's a good idea to specify deep junction boxes suitable for any switch size. Whole-house surge protection - A whole-house surge suppressor will protect your electrical appliances and home entertainment products. Wiring for data - You will also need to consider cabling for your audio-visual equipment, telephone, heating, ventilation, cooling and security systems. You will need to choose a site for your central wiring hub. Cables from different rooms and external cabling will meet here. Ideally your hub should be close to your audio and video equipment. We’ll be happy to discuss your smart home requirements with you, so please get in touch. A University of Dundee research team is developing a new type of smoke alarm designed to wake children. It has been overwhelmed by the response to its request for families to take part in trials. 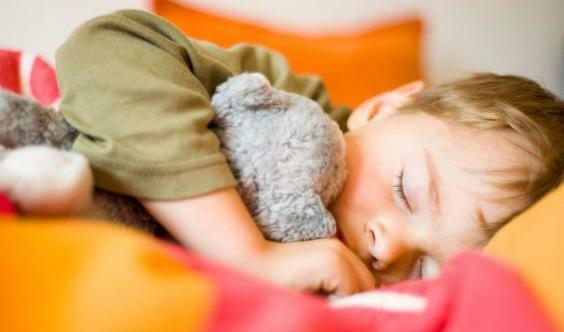 There is evidence that children don’t always wake when typical smoke alarms are triggered. Research has shown that children respond differently to adults and that boys and girls wake to different sound combinations. A low frequency alarm and spoken message seem to be most effective. 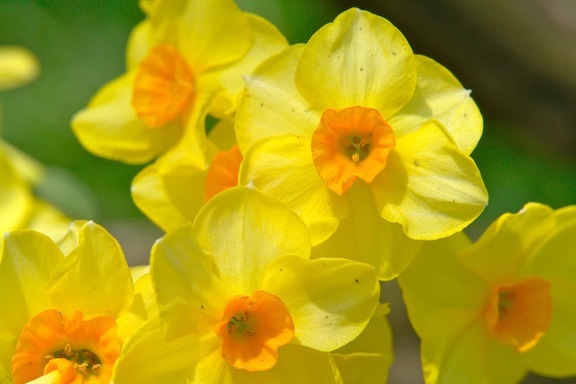 Now that the days are getting longer and the spring flowers are appearing, it’s time to head out to enjoy and maintain your garden. If your garden electrics make contract with the ground, there’s a risk of shock and injury. Here are a few tips from us to keep you safe whether you’re mowing and trimming or lighting and relaxing. Use residual current devices (RCDs) for outdoor electrical equipment and test your RCDs every three months. Store your electrical garden equipment in a dry place when not in use. Check and repair your plugs, extension cables and all your equipment – make sure it’s disconnected from the power supply first. Wear protective footwear and clothing, especially in damp conditions – don’t use electrical equipment in the garden when it’s raining. Follow the manufacturer’s instructions for any equipment you are using. Always unplug your electrical garden equipment after use. Article 50 is due to be triggered by the government this month to start the process for the UK to leave the European Union. 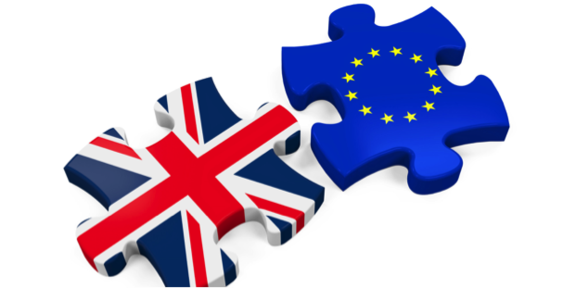 Daren Staniforth, Technical Development Manager at the NICEIC, said this week that he expects Brexit to have “very limited impact” on the UK’s wiring regulations. The European standards body (CEN) and the European Committee for Electrotechnical Standardisation (CENELEC) are independent, so the UK’s membership doesn’t depend on the European Union. The British Standards Institute (BSI) says that Brexit will not affect its ambition to continue to be part of the European standards system. UK experts will continue to contribute to the development of European standards, which will be adopted as British Standards. Any conflicting standards will be withdrawn. 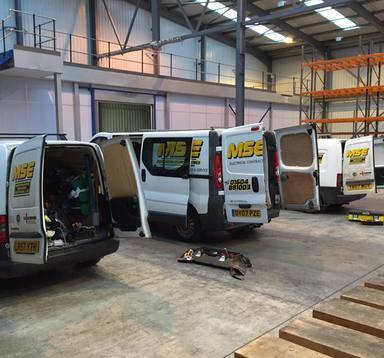 Maintenance Services Electrical is looking for an Electrician to join our fast growing team! We would prefer experience in all Domestic, Commercial and Industrial areas of work. Testing and Inspecting experience is also a key part of our field. We are looking for someone who can work well with our team and importantly our customers. We work to a high standard in order to maintain our extreamly good reputation and are celebrating over 15 years in the NIC EIC. Therefore professional, tidy, clean workmanship is required. Once the decision to extend your home and install your dream kitchen is made, detailed work to deliver exactly what you want is essential. 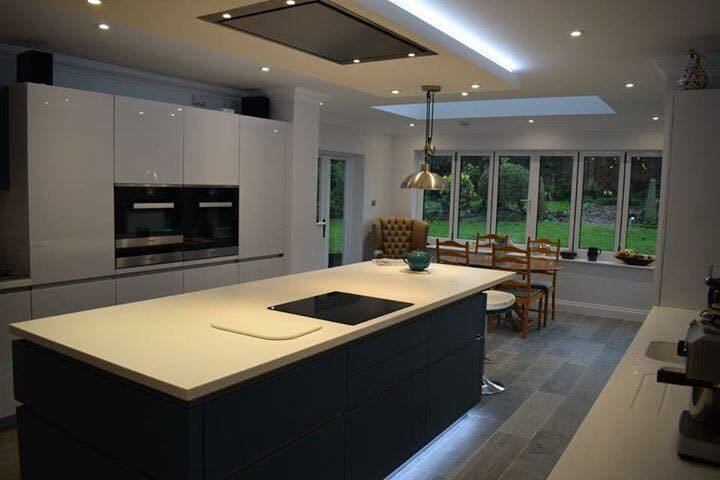 For this project we worked with the principal contractor from the planning stage to make sure that these impressive lighting effects, all the appliances and power points would be exactly what the client was looking for. DID YOU KNOW? Halogen spotlights are being phased out in Europe because they are not efficient – about 70% of the energy they use is lost in heat. You can now buy bright, efficient LED lights for £3 or £4 that could provide energy savings of up to 90% per year. 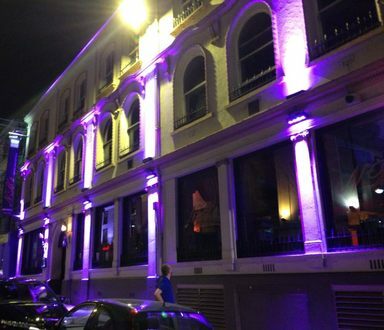 This project (immediate right) to install an intelligent exterior lighting scheme at a popular nightclub produced stunning results and turned this building into a local landmark. 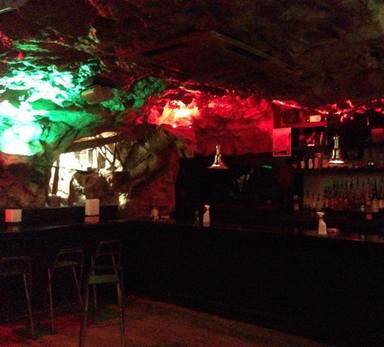 Previously we had installed LED lighting in the cave bar (top far right). For this interior project (bottom far right) we converted traditional 60W lighting to LEDs. Each red light is just 1W, providing big energy savings for this social hotspot. ENERGY SAVING: Did you know that last year it cost an estimated £99million to light the famous Las Vegas strip. If you don’t want to big bill to light the outside of your building, talk to us about LED lighting solutions. 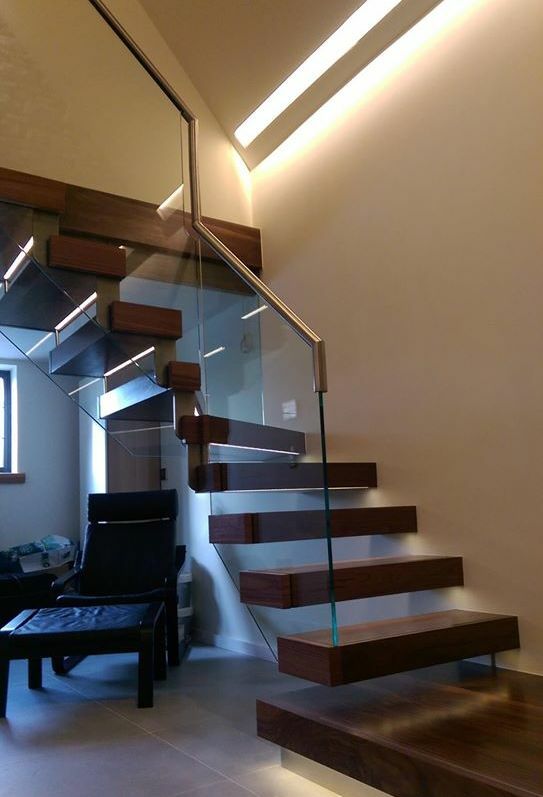 For this renovation project, lighting was going to be an important part of the finished effect. 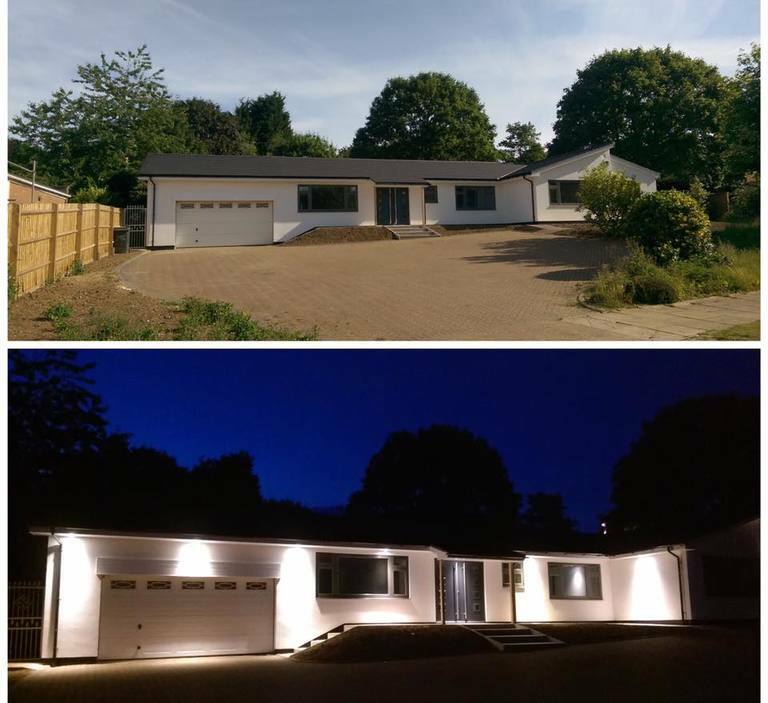 We worked with the principal contractor to produce impressive but very power-efficient results inside and out, using LED lighting for the stunning new look for this property. 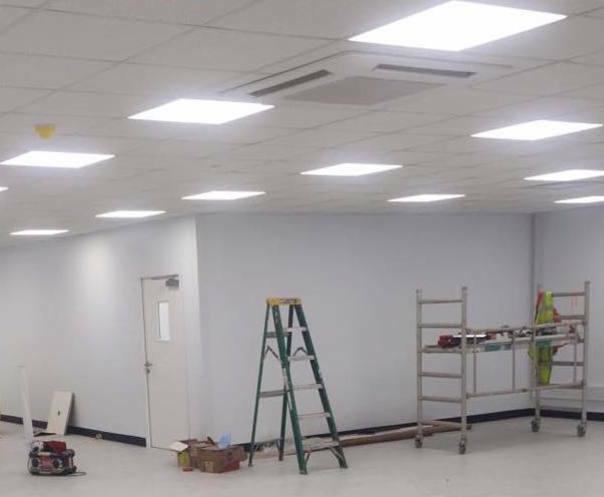 We work regularly with installation teams to complete air conditioning, heating, ventilation and humidification projects for homes, commercial and industrial sites including offices, laboratories, computer rooms, hotels, classrooms and clean rooms. We know that these commercial projects require careful planning to minimise disruption to the supplier’s client. We work with them closely to make sure everything is completed to their high specifications and on time so that the project is successful. 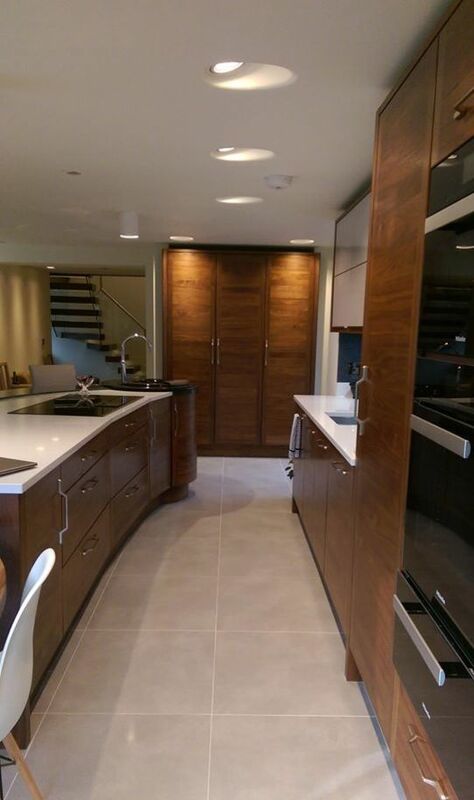 Even this recent, relatively small project required the same attention to detail and team working. We like to work on building projects. For this client, what started out to be some modest renovations to a 300 year-old house turned into a year-long project with stunning results. We worked with the principal contractor to understand the client’s requirements and agree the specifications. 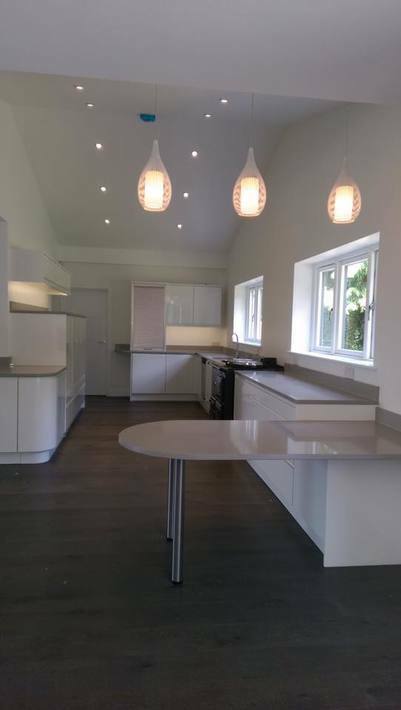 As you can see, lighting was important to the overall effect, but the project also included under-floor heating and a very high-specification control system for the whole house. As there was a professional kitchen designer in the family the new, modern kitchen was a priority and had to be exactly right. 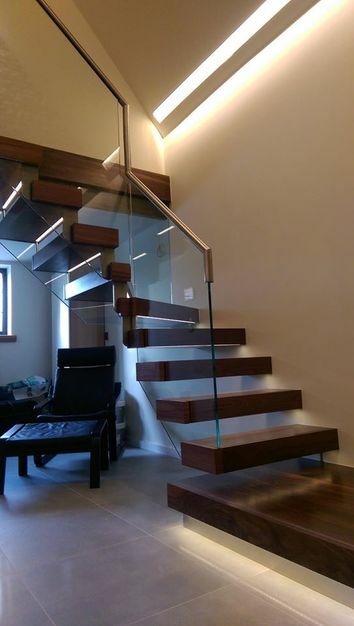 It’s next to the new ultra-modern glass and walnut staircase that has become a focal point in the heart of the house. DID YOU KNOW? 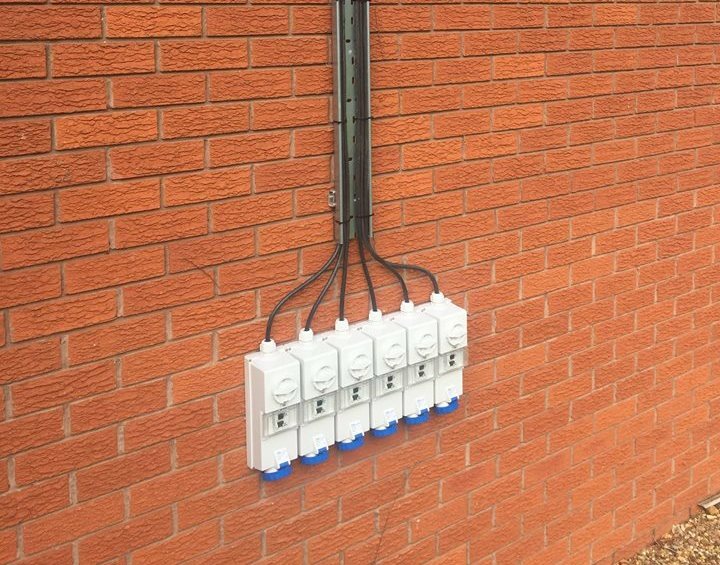 Part P of Building Regulations applies to electrical safety in new residential properties and also to extensions and changes to existing buildings. We have been providing electrical services for this Daventry-based engineering company since early 2015. They produce high-specification component parts and their business is growing really fast. We have been pleased to help them expand their operations. In our most significant project with them so far, we installed a distribution board for every two new weld bays in the production area. Each weld bay contained a three-phase socket, a single-phase 16A socket, a 13A socket, a three-phase stop/start contactor for extraction and a light switch for possible light over the workbenches in the future. We also wired new circuits for machinery and upgraded lighting from fluorescent to low-power LED lighting. The work included cable management to carry the steel wired armoured (SWA) cables to the distribution boards. 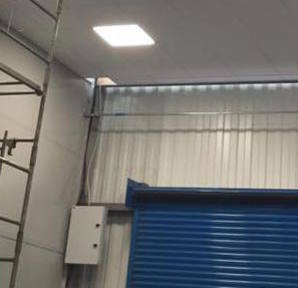 A car ramp was planned, so we installed 600x600 LED panel fittings to give plenty of light! A well-lit office with easy access to power and data makes life so much easier and your working day much more productive. Here we’ve put all the office cabling in the same ducts to keep the finish in this new office space neat and tidy. 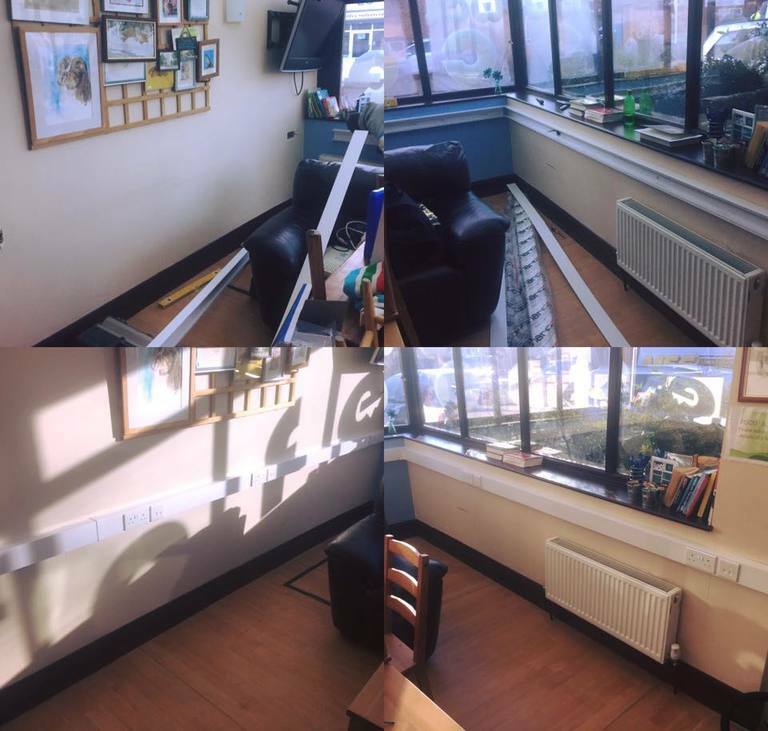 Since we all spend so much time looking at computer screens in the office, it’s important to make sure that lighting is consistent, provides enough contrast between the screen and the background and minimises glare. That’s why the diffuse suspended ceiling lighting we installed here is good too. DID YOU KNOW? Office lighting should meet LG3 (The visual environment for display screen use) and the more recent LG7 (office lighting) standards. Recommended illumination for general office work using display screens is 500 lux. Events are important business for any hotel - conferences, dinners, weddings and parties are all great news, but everything has to go really smoothly for customers. One important consideration is easy access to safe power supplies for music or audio-visual systems, for example. 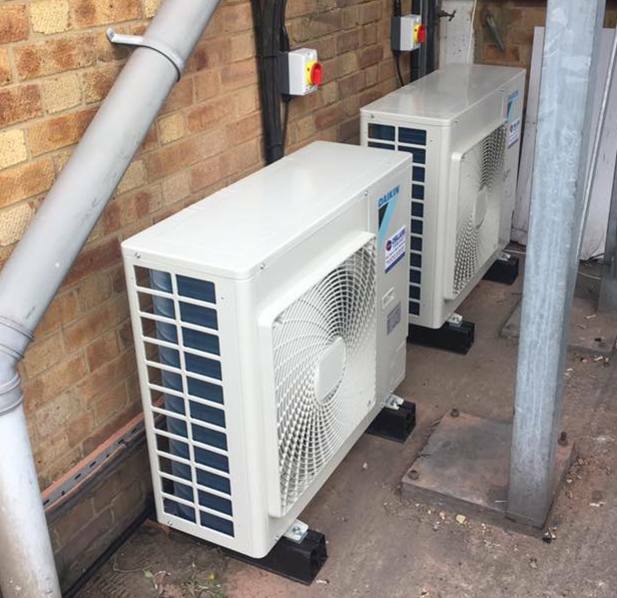 MSE recently helped one Northampton hotel get ready for their busy events schedule by installing outdoor RCD-protected sockets. An RCD, or residual current device, prevents dangerous electrical shocks and helps to protect against the risk of electrical fires. It will switch off electricity automatically if there is a fault. TIP: test RCDs every three months. 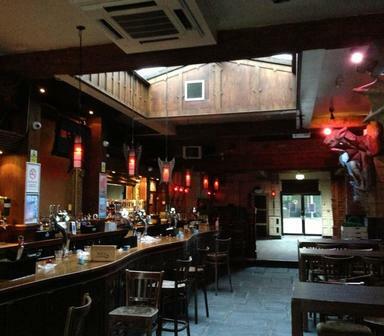 Heres a nice little job in Coventry we completed last week. Trunking system to supply new sockets and data outlets to a cafe area. Consort trunking is a really good way of running power and data around offices. It has dividing strips built in to keep the two cables seperate. A customer had asked us to convert some sockets and chop in. We stumbled across this disaster! Taped up twisted connections just waiting to fail. We were amazed it still worked. An Electrical Installation Condition Report was recommended. We have been busy out and about on the local farms this Harvest installing power to grain stores. 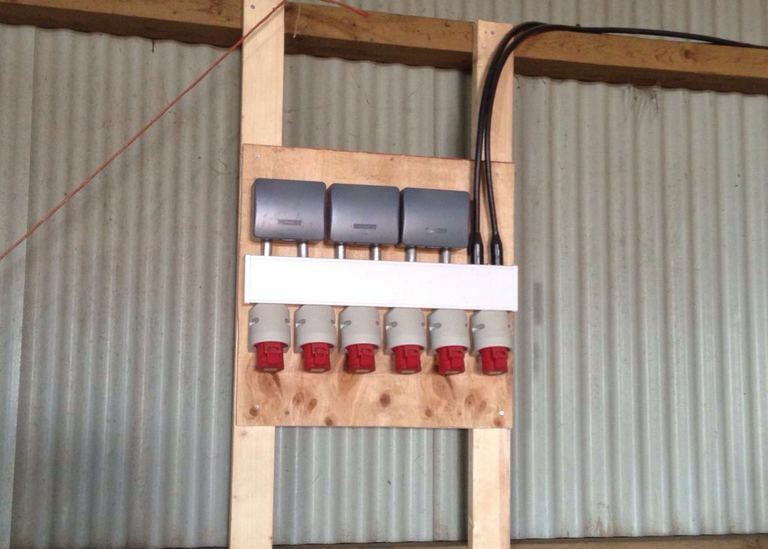 Check out the Agricultural page for more on our farming electrical services. 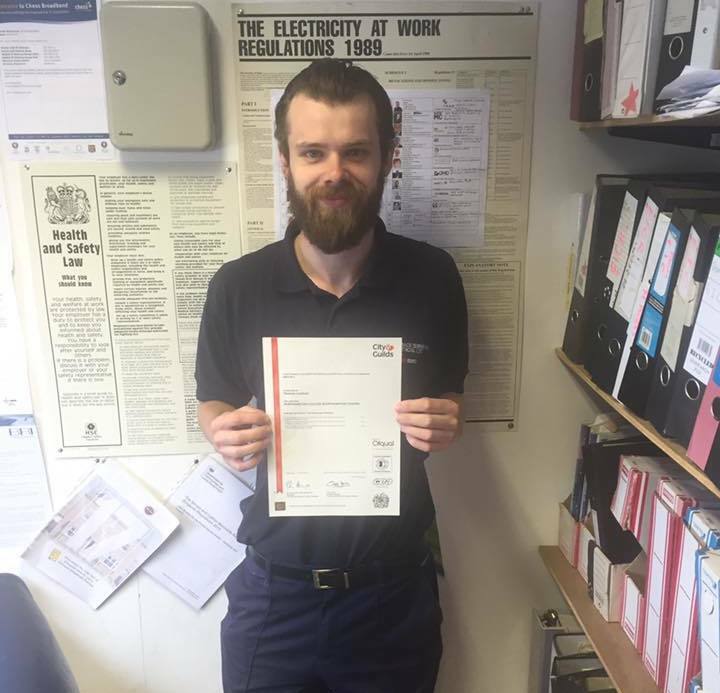 Congratulations Tom on achieving the Level 3 award in the initial verification and certification of electrical installations. Our Case Studies page has been updated with entries from Jesus Fellowship, Chillaire Ltd and Larkin Homes. 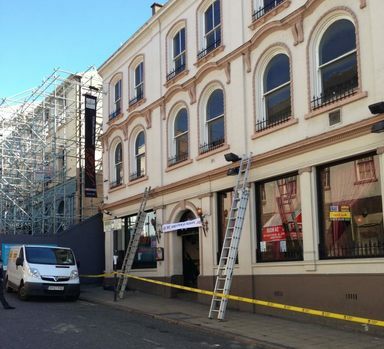 Northampton has seen at least three major fires in recent years as a result of electrical faults. The Red Hot World Buffet in Sixfields, the Sixfields Tavern and the electrical substation at Far Cotton were all thought to be due to faulty electrical installations. 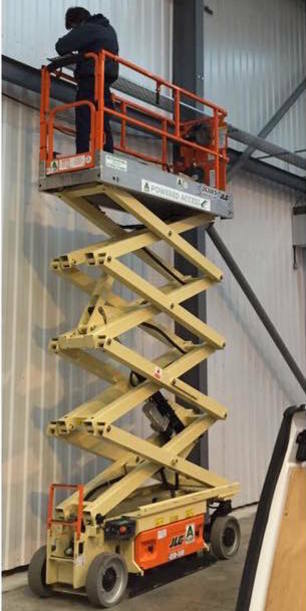 Jim Lockhart, Managing Director of Maintenance Services Electrical says: “It isn’t possible to tell whether electrical installations and equipment are operating properly with a visual check. 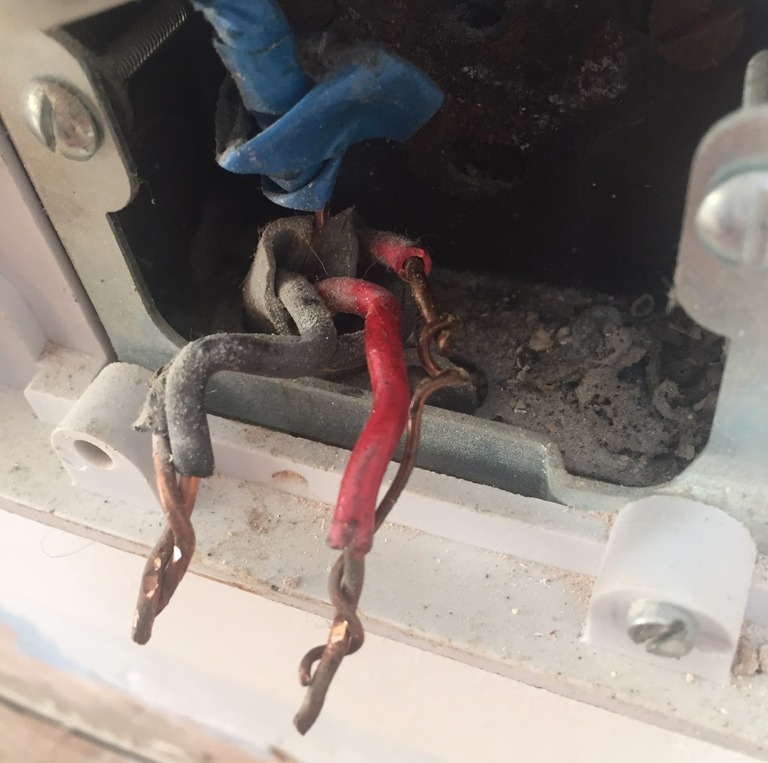 “That’s why it’s important to have regular inspection and testing carried out by qualified electricians who are registered with the National Inspection Council.